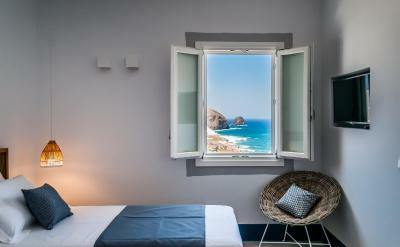 Lock in a great price for Milos Breeze Boutique Hotel – rated 9.5 by recent guests! Great location! 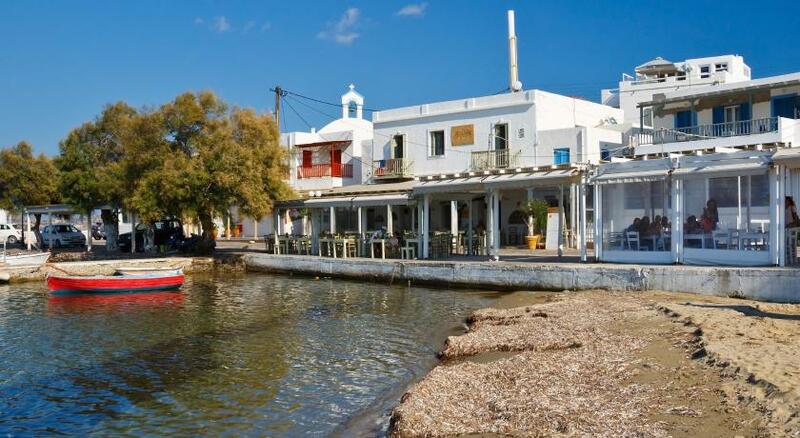 Can walk to the restaurants in Apollonia. Staff was wonderful. Very friendly and helpful. The breakfast is amazing, plenty to choose from. The entire hotel was spotless! the staff is very friendly 5 10 walk to pollonia -nice views breakfast is ok.
Great views and beautiful pool. 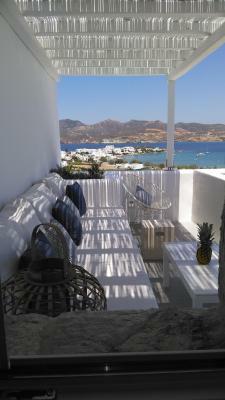 Lovely staff, Maria was so helpful with activities to do on Milos. Great location, Pollonia is a beautiful town with great restaurants. 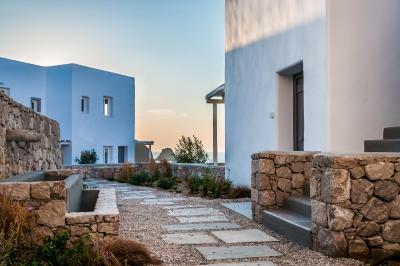 The property was ideally located within walking distance to Pollonia yet was a quiet retreat away from it all. The grounds, pool and facilities were perfect and very clean. Plus, the views from the hotel property were tremendous. Excellent breakfast/coffee and cocktail options were provided as well. 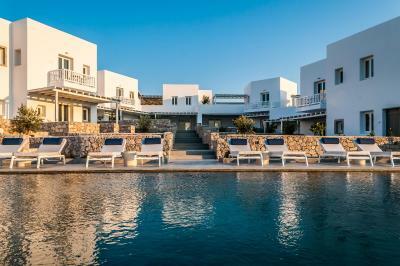 Plus, the hotel staff, especially the manager Michalis, were extremely accommodating. They even allowed us to remain on the property after checking out so we could be comfortable while waiting for our ferry. 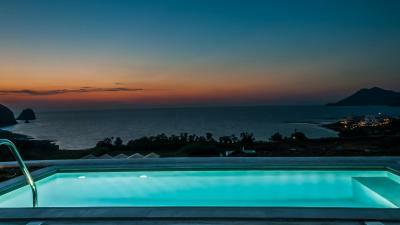 I can't thank them enough and would highly recommend Milos Breeze to anyone searching for a relaxing vacation. We really liked the breakfast and the friendly staff. The location up on the hill provided a beautiful and picturesque views. The grounds were immaculate and small gardens were beautiful. Everything was so clean and well kept. We loved the family-owned restaurant to the right of the driveway of the hotel and the bakery to the left of the driveway. The room was clean and comfortable, though small, with beautiful windows that opened from all sides allowing summer breezes to flow through the room. Pollonia was a great place to stay near many famous beaches. Staff also was helpful in guiding us in where to go in our short time in Milos. Very cute hotel with a beautiful view and friendly staff. Will definitely come back. Great location and property. Rooms are very nice and clean and the staff was very friendly. 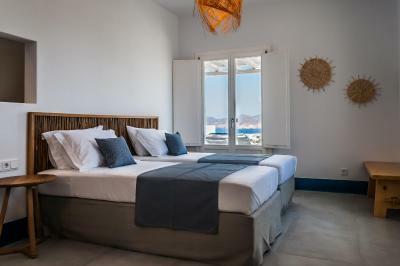 Milos Breeze Boutique Hotel This rating is a reflection of how the property compares to the industry standard when it comes to price, facilities and services available. It's based on a self-evaluation by the property. Use this rating to help choose your stay! Perched on a cliff offering panoramic sea views, the 4-star Milos Breeze Boutique Hotel is located in Pollonia and features an overflow swimming pool and an on-site bar. 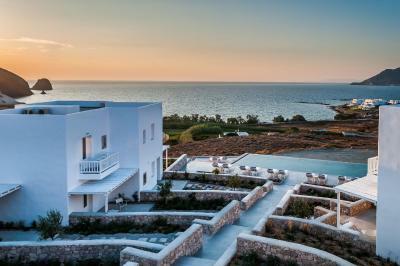 It offers minimal, Cycladic-style accommodations with views over the Aegean Sea and free WiFi. 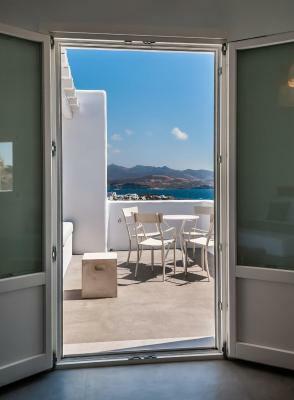 All units at Milos Breeze open to a balcony or terrace and include a flat-screen TV, a mini fridge and a laptop safe. 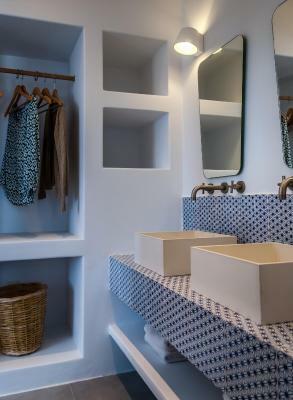 Each features a luxurious bathroom with branded toiletries, slippers and hairdryer. 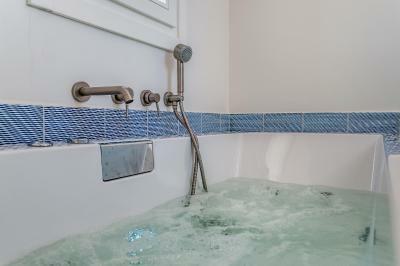 Some units come with a private pool or a spa bath. Guests can start their day with a rich breakfast including Greek yogurt, organic honey and traditional flavors, served daily at the sea-view terrace. 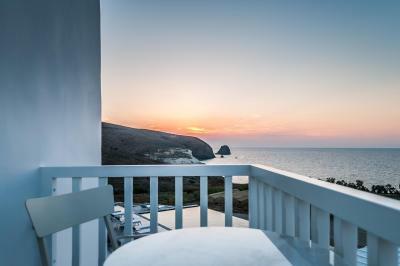 Pollonia Beach is just a short walk from Milos Breeze Boutique Hotel, while restaurants and bars can also be reached within walking distance. 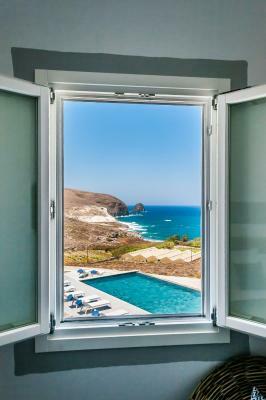 Adamas Port is located 6.8 mi from the property, while Milos Island Airport is 8.1 mi away. Airport shuttle transportation can be arranged upon charge, while free, on-site parking is provided. 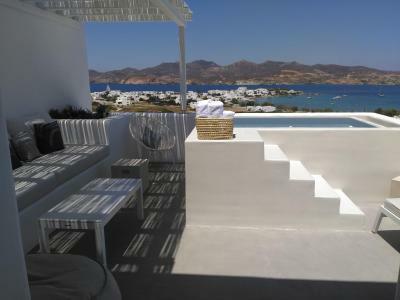 When would you like to stay at Milos Breeze Boutique Hotel? 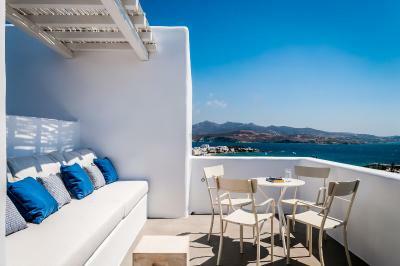 Elegantly decorated in white and blue tones, this air-conditioned room opens to a private terrace overlooking the Aegean Sea. 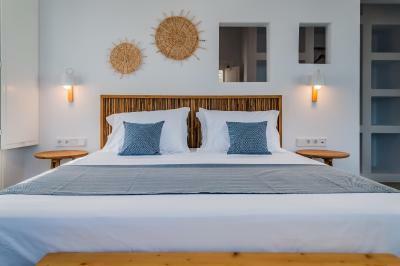 It is fitted with anatomic mattresses and includes a luxurious bathroom with branded toiletries. A flat-screen TV, a mini fridge and a laptop safe are available. Please note that photos are indicative and rooms may vary in layout and orientation. 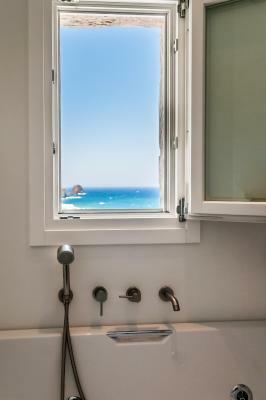 Air-conditioned room with balcony or terrace and panoramic views over the Aegean Sea. 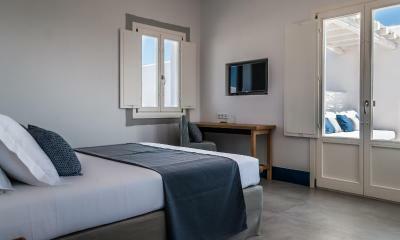 It is fitted with anatomic mattresses and includes a luxurious bathroom with branded toiletries. A flat-screen TV, a mini fridge and a laptop safe are available. 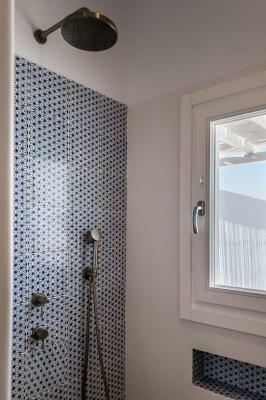 Featuring a luxurious bathroom with spa bath and branded toiletries, this air-conditioned room pens to a balcony with panoramic views over the Aegean Sea. A flat-screen TV, a mini fridge and a laptop safe are available. 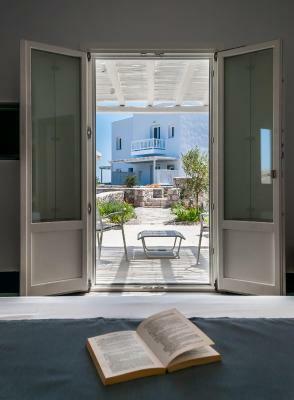 Featuring a private pool and a sun terrace with sun loungers, this elegantly decorated room offers unobstructed views over the Aegean Sea. 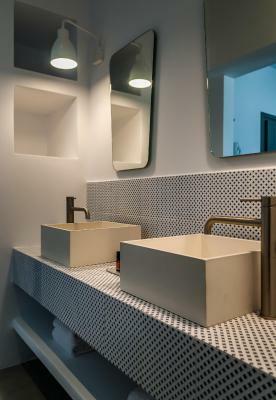 It includes an en-suite, luxurious bathroom with branded toiletries. A flat-screen TV, a mini fridge and a laptop safe are available. 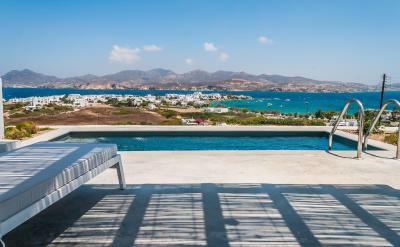 Featuring a private pool and a sun terrace with sun loungers, this elegantly decorated suite offers unobstructed views over the Aegean Sea. 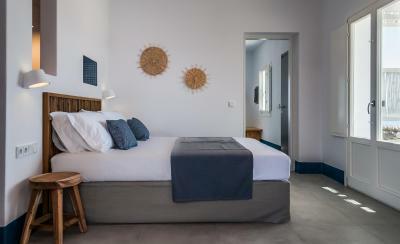 It includes 2 separate bedrooms, each with en-suite, luxurious bathroom featuring branded toiletries. A flat-screen TV, a mini fridge and a laptop safe are available. 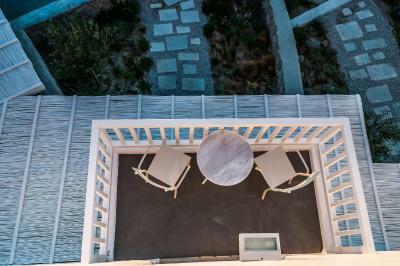 This suite has a balcony with plunge pool and panoramic sea views. 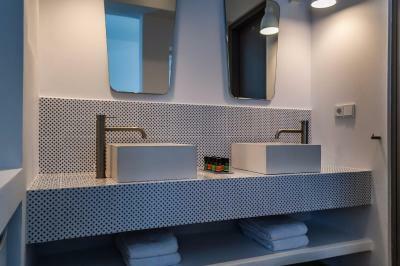 It includes a luxurious bathroom with branded toiletries. A flat-screen TV, a mini fridge and a laptop safe are available. 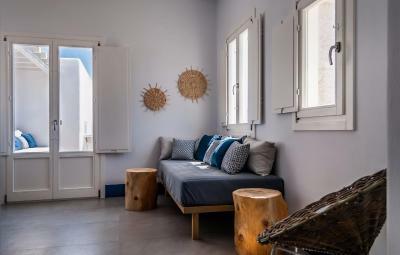 House Rules Milos Breeze Boutique Hotel takes special requests – add in the next step! 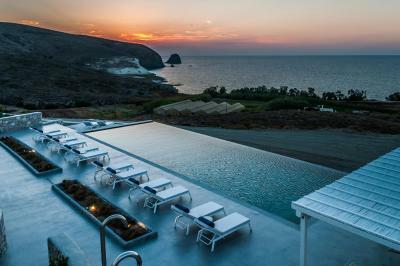 Milos Breeze Boutique Hotel accepts these cards and reserves the right to temporarily hold an amount prior to arrival. Amazing view, close to town with great restaurants. An amazing buffet breakfast with barista coffee, and a mixture of hot and cold sweet and savoury foods. Everything! The staff were The Best! The design of this recently built hotel delightful. Herb gardens surrounded the grounds with delicious scents. 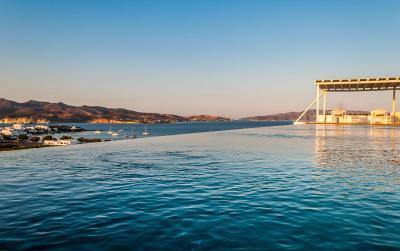 Infinity pool magical. Road into hotel wasn’t paved and very bumpy. No spa facilities. The room was cosy and they thought of everything you might need! Staff were incredibly helpful and helped us hire a taxi, which was cheaper than going directly to them. The staff were very friendly and helpful. The location was amazing. I can’t fault it, only that we didn’t stay long enough. Everything was amazing room facilities view location & breakfast, staff were fantastic & very helpful. Exceptional! 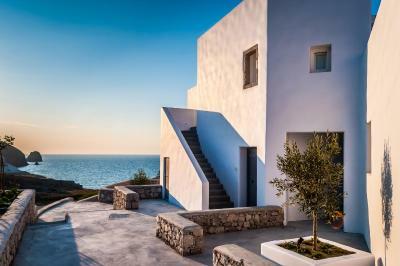 Perfect place to stay if you are in Milos. Although, it is best to have your own transport so you can move around the island more easily. We have only stayed for two nights and they made us to change room for the second night. Very nicely decorated rooms, clean, calm and quite place, ideal for someone to relax, pleasant and helpful staff, very rich breakfast. Highly recommended for couples.